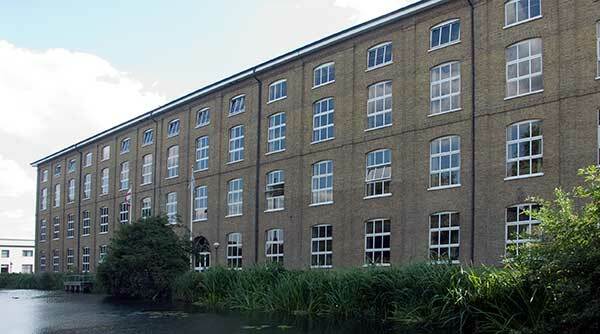 If you pass through Heybridge you won't fail to notice the huge warehouse built alongside the Chelmer and Blackwater navigation in 1866 for the Bentall agricultural works. William Bentall came from a long line of yeoman farmers who were born and bred to the land. He designed a plough that would become the foundation of Heybridge’s main industry. Bentall was farming in Goldhanger, just outside Heybridge, when he made his new plough for use on his own land. So successful was his design that he went on to re-equip his whole farm with them. These ploughs were probably made by the local blacksmith but within a few years their reputation led to other farm owners asking Bentall to equip their farms too. In order to satisfy their demands, Bentall opened a small foundry and smithy on land opposite his farmhouse and demand grew so much that in around 1795 with the support of his wife, Bentall decided to concentrate his efforts on this manufacturing business. He enlarged his foundry facilities and launched the Goldhanger plough on the farming community. The plough achieved a reputation for outstanding excellence and Bentall found the village of Goldhanger restricting his growth. Raw materials had to be brought by sea to the Blackwater estuary and then transported by lighter and road to the foundry. Bentall found land available beside the recently opened Chelmer and Blackwater canal at Heybridge, just three miles away, and in 1805 the first buildings were erected on this new site. Raw materials could now be brought directly up the canal in lighters to his new works. The innovation continued and in the year following the move to Heybridge William Bentall introduced the first steam powered threshing machine followed by a selection of other agricultural implements. Bentall never took out patents on his designs but relied on customer satisfaction to ensure the continued success of his products. The Bentall name stood for quality and his factory ran at maximum capacity. In 1814 the country was engaged in the Nepoleonic war and due to the restriction on importing wheat from Poland, vast areas of land were being broken up for grain production. The demands for agricultural equipment was at a peak. Finding no problem selling the output of his factory, Bentall was becoming a wealthy man. In 1814, William Bentall had a son Edward Hammond Bentall who succeeded his father to run the management of the business twenty two years later. Edward Hammond Bentall had inherited his father’s aptitude for engineering and had been born to a period of intense engineering expansion leading to an insatiable demand for the products coming out of the Heybridge works. His mother had already seen to it that he was taught the workings of the foundry and was taught to make a ploughshare. At the age of 22, Edward had an inquiring mind and a sense of adventure as well as having inherited his father’s engineering genius. These qualities led to business into rapid expansion after years of gradual growth. In order to safeguard this expanding business in 1839 Edward began to trade under the name of E.H.Bentall & Co adding status to the name and in 1841, a patent was taken out for an “improved” Goldhanger plough to protect the product against imitations. 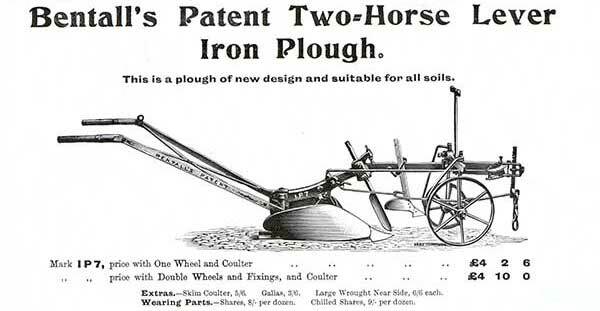 Another new design was patented in 1843 and that was the Broad Share Cultivator which was a tremendous success when it was put on the market. Sales of Bentall products had been mainly in the local counties but this new plough began to find markets throughout Britain and across the seas in the Colonies. Expansion went side by side with demand and new buildings were erected at the works and more staff trained. The quality however, never changed and the Broadshare plough was awarded a gold medal at the Great Exhibition at the Crystal Palace in 1851. Edward Bentall continued to further improve this plough until it gained three first prizes at the Royal Agricultural Society’s show in Warwick in 1859. The word of its reputation spread and orders started coming in from all over the world. In 1871, the products were modified to enable them to be marketed in Europe and Edward Bentall became a very wealthy man. Edmund Ernest Bentall started to take over the management of the business from his father, Edward, in 1889. 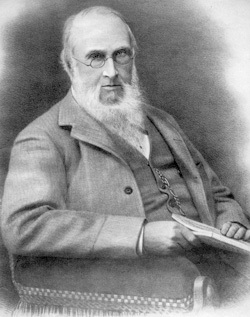 Edward Hammond Bentall died in 1898. Edmund had taken over a very successful business now nearing it’s centenary and in the early 20th century, under his leadership, Bentall’s rose to the challenge of the new internal combustion engine. A Bentall designed engine with many advantages over other designs became a very important addition to the work’s output. It was a slow running machine with small fuel consumption and was also one of the cheapest petrol engines on the market. Designed for ease in repair, the engines found themselves used for purposes as varied as driving chaff-cutters, crushers, pumps and even milking machines. The Bentall engine won medals at the great Brussels Exhibition and the International Exhibition in Turin. Edmund Bentall was a keen motorist, the first man to own and drive a motor car in Maldon and set about designing a car that would incorporate a Bentall design petrol engine. When he began to work on the design of the engine, petrol engines for cars were made with separate cylinders and he based his design on this principle. Unfortunately, by the time the car came into production, the monobloc system had come into fashion but it was too late for Bentall to change the design as all the necessary jigs and tools had been made. 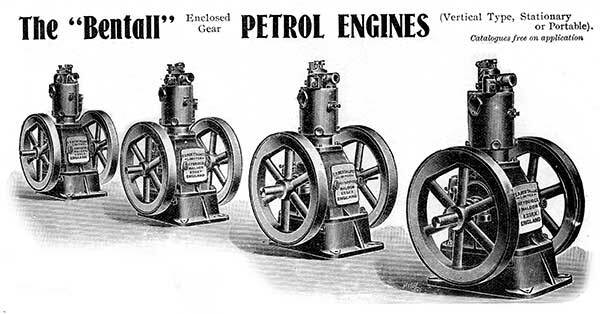 The new monobloc engines had a smaller bore than the Bentall engine which was put at a disadvantage when the new system of horse power tax was devised. The Bentall engine had a diameter and stroke very nearly equal and attracted a higher rate of tax and few buyers were to be found willing to face paying the heavy road fund tax. The car was a costly failure to the company and although around one hundred were sold it was considered that redesigning the engine would be too costly and car manufacture at Heybridge was discontinued. The experience was not wasted, however, and Bentalls continued to improve the design of small petrol and paraffin engines and produced the first horizontal petrol engine in this country and sold many thousands. It was also the start of a large trade in the manufacture of valves and, from 1904, formed an important part of the output of the factory. Bentalls were pioneers in valve manufacture and went on the produce over a million a year. 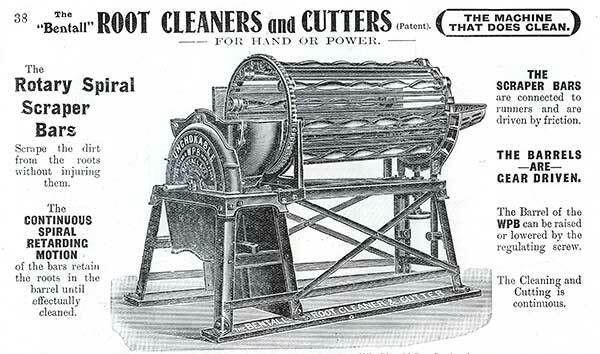 E. E. Bentall was an innovator in other ways and equipped the factory with it’s own generator for electric power. The business also saw the increasing use of the railway because of reduced cost and the barges disappeared. By 1914, the works was employing some six to seven hundred hands with the works covering an area of about fourteen acres. Despite the losses due to the failed car manufacturing venture, the business continued to prosper with the output of agricultural machinery expanding each year. During the years of the Great War, a large proportion of the work’s output was switched to production of shell cases and many million were made during the four years of fighting. Women workers were introduced into the works as moulders and the shop was equipped with pneumatic hoists so that they would not have to lift heavy weights. The fortunes of the company took a disasterous turn at the end of the war. An association of engineering firms was formed under the name of Agricultural & General Engineers Ltd and Bentall was persuaded to to merge his firm into it. Although Bentall & Co was the largest company in the association and the whole of the share capital was turned over to the new group the company had only one vote on the board. The association did well during the boom years following the war but things were not looking too good for the future. The boom was followed by a slump and the association tried to counter the shrinking trade by launching further ambitious schemes including the formation of new companies in the Dominions. The association failed and the venture ended in total loss. Bentall, being the largest shareholder was hardest hit. All his money that might have used to put Bentalls back on it’s feet was lost. Bentalls were in for a difficult time and had to start almost all over again. Sales had fallen to an unprecedented low and confidence in Bentalls had taken a severe blow. In 1933, E. E. Bentall purchased the ordinary shares of the company from the receivers of A.G.E.Ltd with the help of a little capital borrowed from friends and began the task of rebuilding the company. Charles Bentall became managing director with his father as chairman. Some years of hard work were ahead but with the help of loyal staff who were prepared to work for reduced wages the business showed yearly improvements and the company’s debts were finally paid. Bentalls was prospering once more. The revived company played an important role in the second world war. Production set up for the manufacture of small machine parts for the aircraft manufactured by Handley-Page. The works went on to also produce complete assemblies such as tail fins and bomb floor for the new Halifax bombers and before the war ended some one thousand men and women were employed in the works. Also, because of the difficulty in importing food stuffs during the war years, output of agricultural machinery doubled to meet demand. In 1946 E.H.Bentall & Co was recognised as a public company with Charles Bentall as Chairman. It continued to produce increasing volumes of agricultural machinery and valves for combustion engines. Although trade with the coffee plantations had suffered during the war the business was recaptured and rose six fold. Bentall technicians travelled to many countries advising on mechanised coffee processing. The works were modernised with more buildings added and, in 1949, a new foundry was built to meet demand for products. The year also saw the purchase of Tamkin Bros & Co of Chelmsford and the manufacture of their products switched to the Heybridge works. 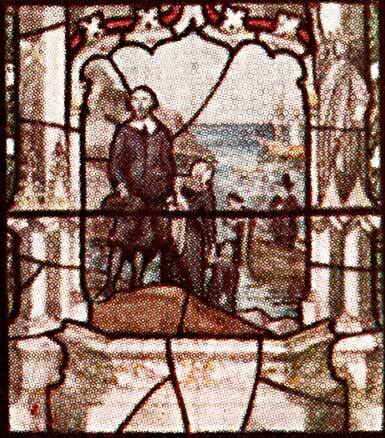 In 1955, the year the firm celebrated it’s 150th anniversary, Charles Edward Bentall died. In 1961 the company was taken over by the Acrow group of companies which went into receivership in 1984. The business founded nearly 180 years before closed in Heybridge.